An inexpensive source of good protein, eggs are available at supermarkets, health food stores and even gas stations. Egg cartons are stamped with an expiration date or a use-by date, which indicates the last day on which the eggs will have the best taste and the highest quality. Eating expired eggs can increase your risk of feeling sick to your stomach or getting a food-borne illness. Knowing the risks will help you consume eggs safely. Egg processors are not required to stamp egg cartons with an expiration date, but the cartons must carry a date that tells consumers what month, day and year the eggs were packed. As long as eggs are stored in the refrigerator at 45 degrees Fahrenheit or cooler, they are safe to eat for four to five weeks past the packing date, according to the Egg Safety Center. That date is somewhat debatable, however, given that the U.S. Food and Drug Administration, or FDA, recommends that you consume eggs within three weeks after purchasing them. If the carton is stamped with an expiration date, the date must be no more than 30 days after the eggs were packed in the carton, the U.S. Department of Agriculture reports. Salmonella is the most common kind of food poisoning, according to the FDA, and eggs can be one source of that bacteria. 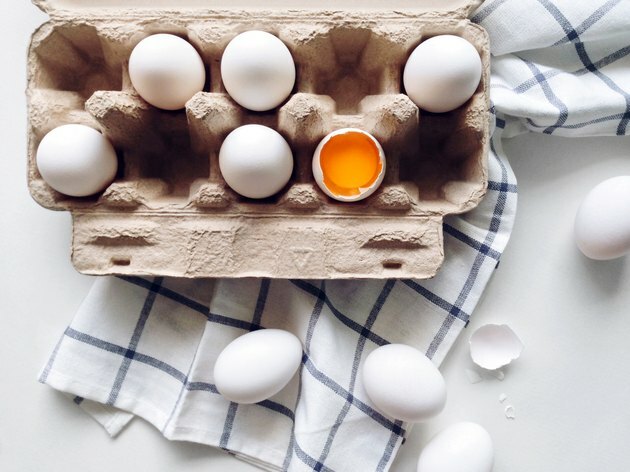 Both the egg shell and the interior of the egg, including the white and yolk, can be contaminated with salmonella, and improperly cooking or storing the eggs increases your risk of getting sick. Richard Emerson, author of "Read the Label! : Discover What's Really in Your Food," notes that salmonella can build up over time, which means that the older your eggs are, the more salmonella bacteria they might contain. This is particularly true if your eggs are stored at a temperature above 40 degrees Fahrenheit. Because you can't see the bacteria that causes salmonella, it's imperative that you throw out expired eggs. All eggs eventually spoil, but the organisms that cause the spoilage won't cause food-borne illness, according to the Incredible Edible Egg website. As eggs age, however, they can grow different kinds of bacteria, called pseudomonas. This bacteria causes eggs to turn a bluish-green color and to develop a sour, fruity odor, according to the Incredible Edible Egg website. Mold can grow on eggs as well, if they're stored in humid areas or are washed in dirty water. Though pseudomonas and mold don't cause food-borne illnesses, they can make you sick to your stomach, so if you notice a change in color, odor or appearance of your eggs, play it safe and don't eat them. If stored properly in the refrigerator, your eggs may not spoil at all — the yolk and membranes inside the shell will just flatten, thin and eventually dry up. So even if it hasn't spoiled, that old egg may not be good to use. Do a simple "egg float test" to find out: gently immerse the egg in a bowl of lukewarm water. If the egg floats up to the top, it's dried out too much to be of use. Inspect any carton of eggs you wish to buy to determine if the eggs will remain fresh until you plan to eat them. You should also open the carton and check the eggs; skip any carton that has eggs that are cracked. Always store eggs in the refrigerator, and consider any egg that's been left out for two hours or more no longer good. That's because as an egg warms up it sweats, which can encourage harmful bacteria to grow, according to the Egg Safety Center. Egg Safety Center: How Can We Help You?